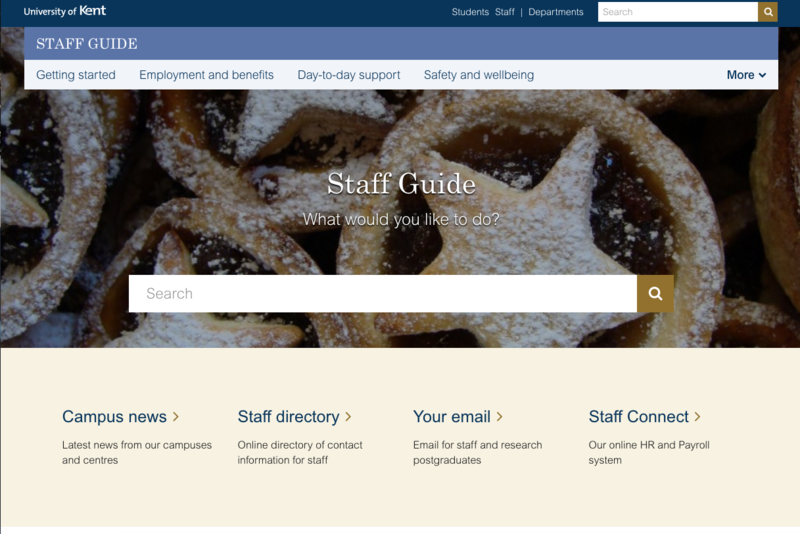 Our brand new Staff Guide webpages are launched today (Wednesday 12 December). A team, led by Wendy Raeside and Etienne Donzelot in Corporate Communications, have therefore spent much of the past year developing an alternative to our Campus Online webpages. They have been working closely with colleagues in other key Kent teams, such as WebDev in IS and HR, to ensure the new pages contain everything you need to know about working at Kent. A major feature is the new Search function which, in the first instance, is limited to information contained with the Staff Guide pages, and should help you find the key information you're looking for. There are also prominent links to key services for staff, including Campus News (linking to news on the former Campus Online pages), Online Directory, Your Emails and Staff Connect. Lower down the home page, you will see highlights of latest staff interest stories, again with links to latest News Centre/Campus News stories. We hope you enjoy using the new Staff Guide!